Peter Lynn; a company that makes kites for or over 40 years from a country that also is the home of several former kite world champions like Youri Zoon and Kevin Langeree: the Netherlands. After several decades of developing foil kites, originally starting with Peter Lynn in New Zealand, the Peter Lynn company started to produce tube kites. So the company has a lot of experience and is perfectly located in a wind driven country. So far, so good. But what can we expect from their kites? We have tested the 2015 Peter Lynn Escape 9m. It is in the little details where you will discover that Peter Lynn has put their experience to use while designing the Escape. For example a ring which slides along the bridle (instead of a pulley with damaging wheels), 4 struts (so no middle strut), a big in- and deflate and three possible settings for the steering lines. There is just one detail which needs some explanation. Their safety system is configured with a different view, but offers two options regarding the setup of this system: the standard dual front line safety or the one with a longer line. The release of the push-away system (which works in a way that you can expect from a good safety system) on it’s Navigator SL bar is like many others, but the bar won’t sheet out as far away as most other bars from other brands. (see the video and the picture from the manual). When you activate the safety of the Escape on the standard setting, a certain amount of pressure will remain in the kite. According to Peter Lynn this pressure doesn’t affect a safe stop. When a situation occurs which requires to activate your safety the remaining pressure in the kite will make sure that you don’t end up swimming through your lines and get tangled up by them. This allows you to easily retrieve your bar, launch your kite again or perform a self rescue if needed. It is a well considered choice that they’ve made, but for those who have their doubts regarding this safety system, like we do, the 2015 Navigator bar does come with an extra line that can be fitted (as can be read in the manual), which should release more pressure than the standard setting, once you’ve activated your safety. This is still no real total flag. Even after a second look at our review we had a firm discussion with Peter Lynn on it. We have had a look on it at several kite discussion sites and it turns out most people support the opinion that the vast majority of dual front line safety systems out there are not entirely safe. Factors like how far the bar can go up, the shape of the kite and if the kite has pulleys, does influence the amount of pressure that remains in the kite after activating the safety. Safety is an important factor(that is why the word safety turns up 62 times in the manual of the Peter Lynn Navigator bar) and as we understood talking with them, it could be that the next generation Navigator bar will have a total flag out safety system. A second detail we don’t understand is the statement in the manual to pump the kite at only 6 psi. At 6 psi any kite will feel unresponsive and wobbly. Experienced kiters will pump the kite rather to 8 or 9 psi, which will give the kite the stability it needs. Especially in (over)powered or gusty situations. When asked Peter Lynn they answered just like Bull it is just a warranty clause and indeed far off from the real pressure needed. But there are also companies like Ocean Rodeo (8 psi for a 9m) and F-One (10 psi for the Bandit 8) that are fair enough to tell the truth and give the real needed pressure on their kites or in their manuals. The Peter Lynn Navigator SL bar has 21m lines, a twistable depower line (something all 4 line bars should have), a slightly oval bar, a stopper “ball” on the fly which works at least as smooth as any other system we used. One example of a neat solution from the Peter Lynn bar is how to ride on suicide mode (for unhooked tricks). The way the safety ring can be attached to the chicken loop (see drawing). This way it has almost the same safety as riding normally hooked. We tested the Escape in several conditions; from 20 till 26 knots at open sea with moderate waves. The Escape is described as a kite which should progress and boost your confidence as a rider. The provided graphic from the website of the Peter Lynn Escape shows a (green) usage from intermediate till expert. 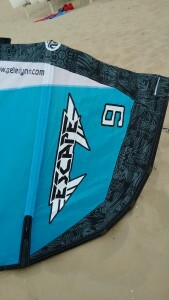 Some other reviews even go as far to compare the Escape with freestyle kites. In our words the Escape would be the kite to buy before you (decide to) buy a real freestyle kite (with no bridles, like the North Vegas or the Best GP). One of the first things which comes up when starting the Escape is the (slightly) oval bar and the amount of bar pressure. This is clearly above average, even with the lines set at the outer tip (the lightest and fastest setting). While kiting the power is not easily released by pushing away the bar. It has a long power reach (something we also noticed at the Naish Pivot). This does help to get a nice float in the air (air time), but it also means that -for example- the Escape request you to deal with the power (edge harder and get the kite low) in a gust. The relative large power reach also makes it a bit difficult to find its ideal pop moment for a high jump. range. It works it way quite naturally upwind and through wind lulls, probably due to its constant pull. Looping the Escape is not that difficult. Although the kite is far from quick, it has an easy -and thus mild- rotating feeling while making an average sized circle. It is not meant to make a Ruben Lenten mega loop, but it will let you do your first ones without that nasty pull. The same goes for unhooked tricks; the kite will not give the pop as most experienced unhooked riders require, but it is stable and powerful enough in low winds to try to make your first steps in unhooked tricks. Some of our more experienced testers did not like the high bar pressure and would have like it to be quicker and a bit more challenging but no two riders are the same and the less experienced, stronger and heaviest tester was happily surprised by the performance of the Escape in low wind. To our opinion the Escape can also be used without any problem by beginners. Due to the stable pressure on the back lines it is easy to feel at what angle and what position the kite is. 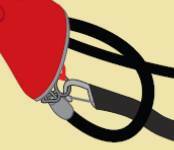 But especially for those beginners, the safety should be adjusted with the provided longer safety line.